Themes: nature, thankfulness, prayer, animals, ryhme, environment. Awards: Honour Book: Picture Book of the Year, Children s Book Council of Australia Awards, 2010; short-listed for the 2010 Queensland Premier s Literary Awards Children s Book – Mary Ryan Award; short-listed for the Speech Pathology Australia Book of the Year Awards 2010, Lower Primary Category. To add this book to your home, school or library collection click on cover or here. There is something soul soothing about this book. It makes me feel at one with all the animals of the world…even though technically I’m not a massive fan of up close encounters with wildlife and am so phobic about reptiles that Pudstar at two was sent outside to chase away the dinosaur/horrendous blue tongue lizard so we could leave the house – but in a book? GREAT! Bring on the wildlife! Thankful is indeed what we should be for this book and what it shares – the marvel, mystery and diversity of the world of animals large and small. Glenda Millard is a master storyteller and her text for this book is no exception. The lyrical text reads like a song, with the refrain at the end of each page being ‘we are thankful’. In fact the text is similar in rhythm and wording to the well know hymn ‘All Things Bright and Beautiful’, and a good follow up activity is to YouTube this hymn after reading the story. This is Rebecca Cools second children’s book with Glenda Millard and her naïve collage and paint illustrative style blends beautifully with the text. Much time can be spent pouring over the pages and discovering the collage materials used to great effect – check out the quills of the echidna and the stripes of the tiger. Pull out that dictionary! There are some amazing words used in this text and it begs for a bit of dictionary skill follow up. Write a list of the unfamiliar words and look up the meanings. 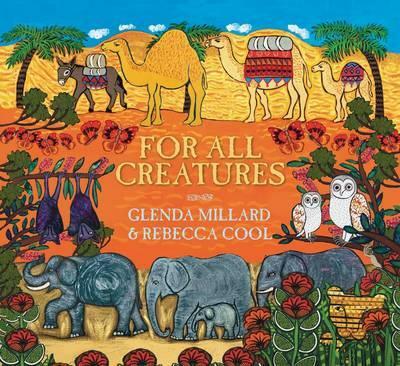 Glenda Millard does not name each animal, rather she describes them. Think of an animal you love. Write or think about some interesting words to describe your animal. Can anyone guess your animal? Rummage through your wrapping paper collection, fabric remnants or collage box. Do any of the prints remind you an animal? Create a collage of an animal.